I hear the Taxi’s horn behind me and stick out my arm to wave it down. It pulls up behind me; an old Toyota, one of the many that comprise the fleet of well-used, beat-up cars that serve as collective Taxis. I stick my head through the passenger side window. The Taxi driver nods, barely noticeably and I jump in, greeting the other two passengers in the back. As the Taxi turns by the park I hear the familiar mourning songs; the slightly sappy but still quite beautiful songs that they blast too loudly from cheap speakers every time somebody dies. There are about 10 songs that they cycle through on a regular basis and by now, I know most of them off by heart. For a small town of 40,000 people, there sure are a lot of deaths. Or maybe just in life there are a lot of deaths but living in a society where death is usually kept private, one doesn’t realize it. You always know when someone dies here. First there is the announcement car : a white car with giant speakers and a megaphone strapped to the roof that functions as a sort of mandatory radio, spewing out local advertisements for shops, government propaganda, reminders for upcoming festivals and events, announcements of deaths and, if there is nothing else to report, the drivers favorite music. Their usual starting time? 5.30am. Then there is the wake with the white chairs set up outside the house and the canopy to block the sun, the grieving family, the community gathered together, the obligatory coca-cola served in cheap plastic cups. Finally, usually the day after, there is the procession. The whole community, neighbourhood, family, relatives and friends gather to accompany the corpse in a slow procession to the cemetary where it is finally buried. 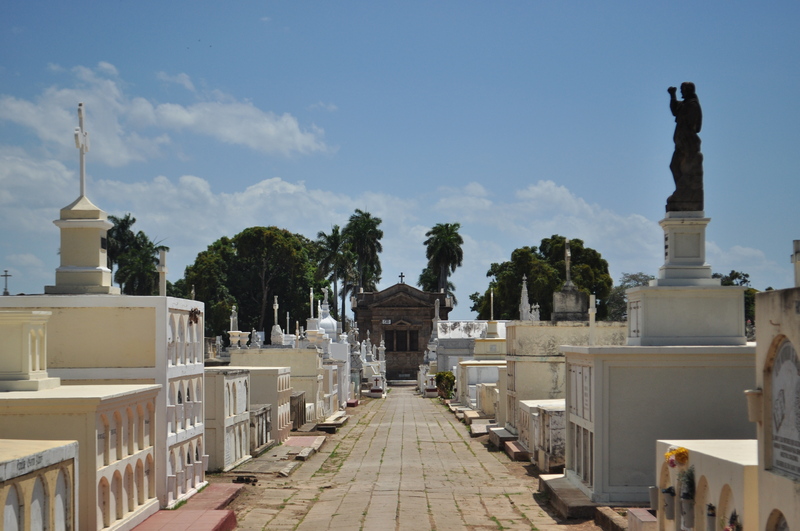 The cemetery in Granada (I know, no picture of the one in Somoto but this one is nicer anyway). The taxi turns the corner to INPRHU, the organization I work at, and finally see the procession of mourners on the opposite street. “Oh look, a funeral” mentions one of the passengers casually.“I wonder where they are coming from, I didn’t hear anything yesterday”. “Sector 24” I say without thinking. “It was a young father, 28 years old.” For a short minute I feel guilty, like I am gossiping, talking so casually about death. No, I reason with myself, fighting to overcome my culturally-ingrained conception of death as a personal thing, death here belongs firmly in the public sphere. I wonder why the announcement car didn’t drive around announcing this man’s death. Maybe it is because sector 24 is one of the poorest in Somoto. Maybe even in death one does not escape social hierarchy and class divisions. The first death I experienced here was the father of my boss. The whole team walked the three blocks to her house where the wake was, sat in the room with the grieving family, drank coca cola out of plastic cups and passed by the corpse, lying peacefully under a blanket of glass. I had to physically force myself to look at the corpse. The other times I have seen corpses up close have all been remarkably unpleasant, like the old begger in Varanasi that we almost stepped on.I would have thought he was sleeping if it weren’t for the flies. “But where is his family?” I remember asking my dad, seeing him struggle briefly with my 7 year old curiosity, choosing whether to tell the truth or not. As always, the truth in India prevails. “He doesn’t have a family, he will be collected with the other corpses and burnt on a collective pyre, if he is lucky”. Shortly after that, maybe a few days later I saw my second one, lying in a white cloth on a funeral pyre, his son, head shaven and solemn, anointing his fathers body with oil before setting the pyre on fire. I still remember the stench of burning flesh, the way his body seemed to crumple up like paper and then melt like wax. And then the last one, bloated and purple with gashes accross his chest on a beach in Goa.I still dream of his blue eyes sometimes, looking up into the emptiness of the sky. My boss’s father did actually looked like he was sleeping, peacefully. For the first time, death seemed almost pleasant. This procession passes the office, as all of them do, almost every day. The team gets up to stand in respect at the gate. “His poor child” says my boss “but apparently he is doing well, they said he was playing outside normally yesterday”. “They say he was the one that found him,” D. mentions. “Actually,” says M. “ he was there when, you know, he did it”. She looks over at my confused face. “He choked, you know” she says, making the sign of a noose in the air, “he choked on a cable”. There are the rumors, of course, that follow: he owed people money, he was lonely, he felt guilty about abandoning his 10 year old daughter. I feel sorry for the community of that sector, one that I have just started to get to know better. For people that literally share a wall with their neighbours, living so close together, such a tragedy has a way of seeping in and dampening the little joy that there is, a dull reminder of much of the struggle that surrounds them. 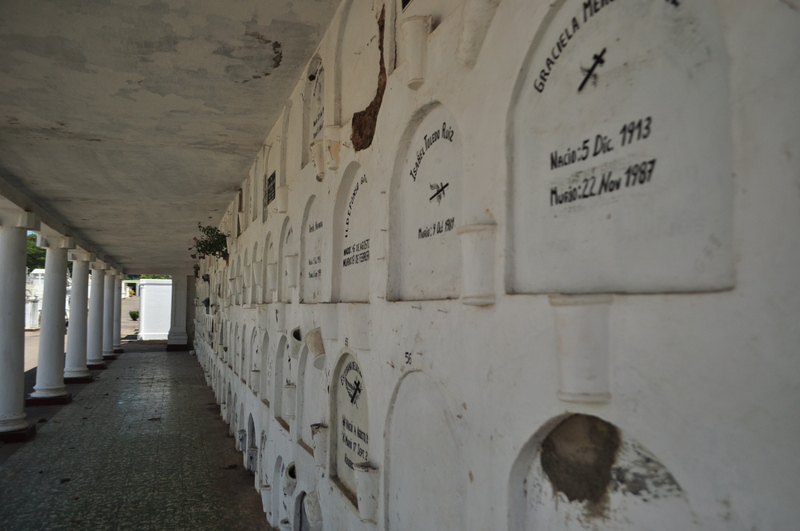 I am forever in awe at peoples resiliance here, their attitude towards tradgedy, their acceptance of death. Maybe it is because they give death its due place in society that it doesn’t seem to affect them in such a negative way. “You know else who died just yesterday” M. says in a more upbeat voice. Everybody seems eager to stop talking about the suicide. “The brother of the husband of that women that lives in administartion. He died of a sickness.” Everyone turns away from the gate with a small sigh of relief to discuss this other death. It seems that suicide remains a universal cultural taboo topic, even here, even in this culture where death is squarley in the public realm. “What sickness” I ask causally, turning back to my work. I feel a certain amount of confidence, like I have understood and accepted, finally, the significance of tragedy and death in this place. However Nicaraguans have this way, every time I think I grasp something, of throwing in something that makes me question all over again my norms, values, and understanding of the world that surrounds me. M. looks at me as if she knows this and hesitates for only a second.